A new patent granted this week aims to stop students from sharing textbooks, both off and online. The patent awarded to economics professor Joseph Henry Vogel hopes to embed the publishing world even further into academia. Under his proposal, students can only participate in courses when they buy an online access code which allows them to use the course book. No access code means a lower grade, all in the best interests of science. For centuries, students have shared textbooks with each other, but a new patent aims to stop this “infringing” habit. The patent in question was granted to Professor of Economics Joseph Henry Vogel. 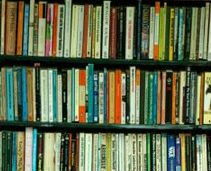 He believes that piracy, lending and reselling of books is a threat to the publishing industry. “Professors are increasingly turning a blind eye when students appear in class with photocopied pages. Others facilitate piracy by placing texts in the library reserve where they can be photocopied,” Vogel writes. The result is less money for publishers, and fewer opportunities for professors like himself to get published. With Vogel’s invention, however, this threat can be stopped. The idea is simple. As part of a course, students will have to participate in a web-based discussion board, an activity which counts towards their final grade. To gain access to the board students need a special code, which they get by buying the associated textbook. Students who don’t pay can’t participate in the course and therefore get a lower grade. The system ensures that students can’t follow courses with pirated textbooks, as tens of thousands are doing today. Lending books from a library or friend, or buying books from older students, isn’t allowed either. At least, not when the copyright holders don’t get their share. Vogel’s idea leaves the option open for students to use second-hand textbooks, but they still have to buy an access code at a reduced price. This means publishers can charge multiple times for a book that was sold only once. Needless to say, publishers are excited about gaining more control in the classroom. Anthem Press of London has already expressed interest in the system and Pat Schroeder, president of the Association of American Publishers, also welcomes the idea. “For every rogue site that is taken down, there are hundreds more demanding similar effort. I can’t think of a more timely example of the need for additional tools,” she says. On the surface the idea might seem well-intentioned, but to proponents of an open knowledge society it goes completely in the wrong direction. If anything, the Internet should make it easier for students to access knowledge, not harder or impossible. While it’s understandable that publishers want to stop piracy, preventing poor students from borrowing textbooks from a library or friend goes too far. Perhaps it’s a better idea to approach the problem from the opposite direction. Thanks to the Internet, publishers are replaceable. And since many of the textbook authors are professors who get paid by universities, it is not hard to release books in a more open system. Professor Vogel believes that sending more money to publishers helps academia, which might be a flawed line of reasoning. Isn’t it much better to strive to make knowledge open and accessible, instead of restricting it even further? c There are 464 comments. Add yours?